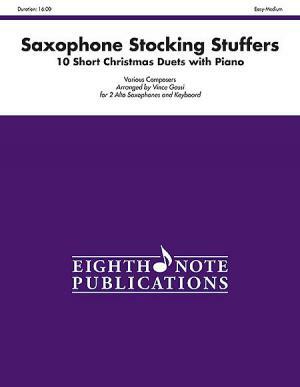 Stocking Stuffers for Alto Saxophone (10 Short Christmas Duets with Piano). Arranged by Vince Gassi. 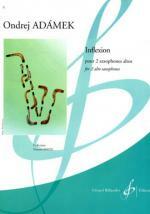 For 2 Alto Saxophones & Keyboard. Duet or Duo; Mixed Instruments - Flexible Instrumentation; Part(s). 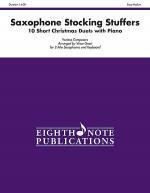 Eighth Note Publications. Christmas; Sacred; Secular; Winter. 12 pages. 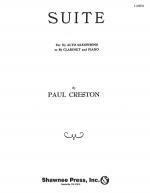 Published by Eighth Note Publications (AP.81-SQ1056). 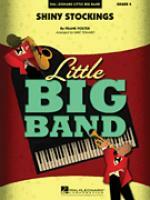 ISBN 1554736579. Christmas; Sacred; Secular; Winter. 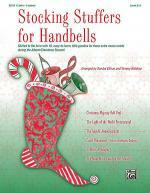 These arrangements are fun and easy and will make a perfect addition to any Christmas concert or holiday celebration. 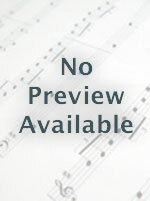 Also available with these arrangements are beautiful, lush orchestral accompaniment tracks available for free download from enpmusic.com or vincegassi.com. These stunning and colorful scorings would make a special addition to a church service or school event. Simply download whichever mp3s you want and play them through speakers and have the instrumentalists play along. 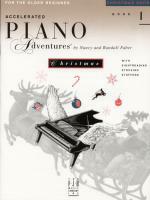 Titles: Good King Wenceslas * Holly and the Ivy * Huron Carol * Jingle Bells * O Christmas Tree * Silent Night * Up on the Rooftop * Little Drummer Boy * We Three Kings * Ding Dong Merrily on High.